Glass furniture in the interior is very popular. Richly decorated or restrained and elegant glass tables, pedestals, racks - glass furniture is amazingly varied, stylish and attractive. 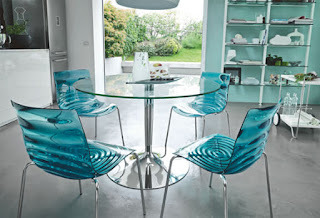 Glass tables can be found quite often in public places, and in ordinary homes and apartments. And if in the past only a desktop was made of glass, now tables are often made entirely of glass. Glass tables can perform purely decorative functions, as well as take on the functions of traditional tables of wood, metal, etc. Artistically decorated glass tables in cafes and restaurants are also widely used. To date, there are many models of glass tables: with round, oval, rectangular and square countertops, with an additional shelf or without, with wooden, metal legs, etc. The choice of a glass table model, of course, depends on the design of the room, in which table will be located. You may decorate glass tables will help of illumination, drawing on the surface, artistic matting, etc. Glass tables are made of hardened tempered glass, multilayer glass. This glass is ideally suited for use in everyday life, as it is resistant to various types of loads. It's almost impossible to break up the glass tables, following the basic rules of operation. With proper care, glass tables will not lose their attractiveness for many years. So, to clean the glass surface, you should use a window cleaner, if necessary using a soft cloth. You cannot use abrasive powders to remove contaminations from the glass table as they can scratch the surface of the glass. Unlike polished surfaces of wooden countertops, which cause bloating and cracks due to hot objects, tempered glass is not afraid of high temperatures, so it's possible to put hot objects on glass tables - this is especially true for kitchen tables. Giovani Glass will make a table which you will surely like.